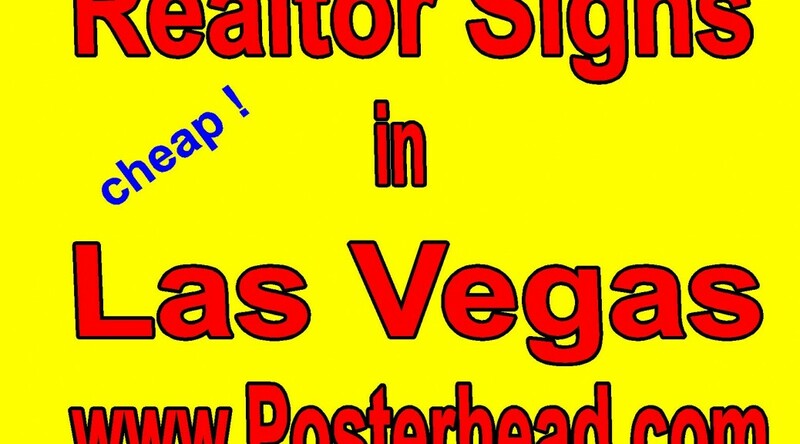 March 27, 2019 Robert W.
Inexpensive real estate signs are available in Las Vegas for realtors wanting reasonably priced real estate signs. This is especially true for Las Vegas realtors who do commercial properties and need very large for sale signs or large for lease signs to show off their property listings. It is said that 10% of all sales and leases can be attributed to a real estate sign. Larger real estate signs draw more attention and have a greater success of being noticed by interested parties. Inexpensive real estate signs help by giving the realtor an opportunity to afford a high quality, low priced sign that can potentially bring a great result. Inexpensive real estate signs are just that, low cost signage. You can obtain these real estate signs with many different substrates like plastic, metal, aluminum, wood and others. Also, many realtors belong to the GLVAR ( Greater Las Vegas Association of Realtors) and that organization has sign companies that are Member benefit Partners that offer discounts on signs to their members. On average, the cost of an aluminum 18″ x 24″ sign sells for around $30, a 4ft x 8ft aluminum sign sells for around $175.00 and a 4ft x 4ft aluminum sign sells for around one hundred dollars. Wood realtor signs are also available for the larger signs as well. With the GLVAR Member discount of 10%, the cost of real estate signage is even less ! The signs themselves can be made fairly quickly, usually in two or three days time. A laminate is usually applied to the signs to prevent fading during the very hot , intense summer days we experience in Southern Nevada. Real estate signs can be purchased through local sign companies and the GLVAR can also recommend sign companies to assist you in getting your signs made quickly and cheaply. After all, 10% of all transactions used for selling or leasing a property are because of signs. March 15, 2019 Robert W.
Las Vegas cheap wood real estate signs are great for GLVAR realtors who have commercial properties for sale or lease or vacant land they are representing for sale. Las Vegas cheap wood real estate signs offer an opportunity for large wood signage at a very reasonable price to get your listing noticed. Studies have shown that a sign at a property location will get a property sold or leased 10% of the time. Therefore, its just a matter of getting your sign noticed to increase your chances of getting the property sold. better yet, your commission goes up if you represent the buyer and the seller ! Las Vegas cheap wood real estate signs are great for getting your listing noticed at commercial properties or vacant land. The heavy duty wood signs can be made very big so that your property will get noticed. Often, real estate agents use large 4ft x8ft wood signs or smaller 4ft x4ft signs and place these signs in front of the property so that they can get noticed by traffic going both ways down the street. The large wood signs can contain a lot of information about the property so that potential clients know exactly what the property offers in order to eliminate time consuming calls that lead to nowhere. Since these signs are temporary signage, they do not require expensive and time consuming permits issued by Clark County, Nevada. ( However, it is recommended you do due diligence and inquire with the County ). Las Vegas cheap wood signs are full color signage that can include your picture on the wooden sign as well. The signs are printed with long lasting ink to help prevent fading during the hot summer months of Southern Nevada. Contact your local sign company about these large wooden real estate signs and see how they can help you . January 10, 2019 Robert W.
Commercial metal real estate signs in Las Vegas are becoming the norm compared to the old wood heavy signs that you used to see in front of commercial buildings that were for sale or for lease. These light weight aluminum sign will not rot in the rain or break apart like wood signs and will last a very long time in the outdoor weather of Vegas. Commercial metal real estate signs made of aluminum are also cheaper than their wood MDO counterpart and easier to install since one person can install them since they are light weight. Commercial metal real estate signs are used for the same purposes of the wood signs. They care usually seen on vacant land in the 4ft x 4ft or 4ft x 8ft size or in front of commercial buildings that are for lease or sale. The metal real estate signs are mounted on wood posts just like the old wood signs so that they are securely placed into the ground to prevent the signs being knocked over in the high winds. While Las Vegas is usually known for hot temperatures during summer and moderate temperatures during winter, the Las Vegas valley does get some very strong winds at times that create havoc with signs. Commercial metal real estate signs cost around $99 for a 4ft x 4ft aluminum sign and $175 for a 4ft x 8ft aluminum sign. They are cheaper than the wood signs and will last just as long or longer than the heavier signs. These signs can be made in just a few days at a local sign shop and they an be made in multiple colors. They can be printed with logos and your picture as well as scenic backgrounds. They are made to help you sell or lease that commercial property. Custom printed real estate sign can get you that custom made real estate sign for your property listing. Custom printed real estate sign can give you that unique sign that sets you apart from other realtors and helps brand your name in the real estate world. There are over 10,000 realtors that belong to the Greater Las Vegas Association of Realtors and you need to establish yourself apart from these other realtors and a custom printed real estate sign is just one way you can do that. The traditional real estate sign is 18″ tall by 24″ wide and is mounted on a .042 aluminum blank. However, this traditional sign blank has changed and many realtors prefer bigger and more heavier signs. The .042 aluminum blank is sometimes replaced with a e-panel aluminum blank ( a double sided aluminum panel with a filler panel to give the sign blank more rigidity and weight). These signs do not bend or get damaged as easy as the single panel .042 blank. Also, the size of the real estate sign is changing as well. Many realtors prefer the larger 20″ x 30″ signs or 24″ x 36″ signs. The real estate professionals like these larger signs because they can get more information on the sign and I guess ” Bigger is Better” in their view. I read in a recent publication that one out of ten real estate deals is made because of the real estate sign that is on the property. Custom printed real estate signs are cheap in price and cost only around $30.00. These real estate signs are usually laminated to prevent scratching of the sign and will last a long time in the outdoors of Las Vegas. Many realtors are also moving to the throw away signs made of coroplast. These signs are literally designed for one listing and then simply tossed at the end of the listing. 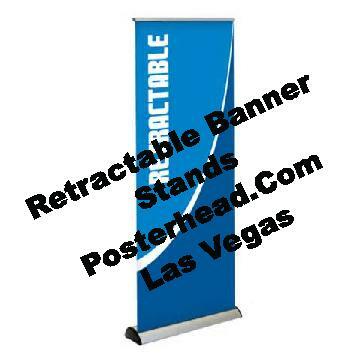 December 19, 2018 Robert W.
Indoor pull up banner stands are a big “HIT” at the trade shows and conventions in Las Vegas. Indoor pull up banner stands are used extensively at these events because they are easy to transport ( allowing you to walk into a convention venue with several of them) and are easy to set up. it only takes a minute or two to set these banner stands up. Best of all, these indoor pull up banner stands are self standing and require no support. They can be placed anywhere in your as a result. Indoor pull up banner stands are not expensive and the best selling pull up banner stand is less than one hundred dollars. There are many different types of stand sizes to choose from and all the stands come with an adjustable pole for height that allows you to adjust it for that perfect sweet spot. The cheaper, inferior tent pole models allow for no adjustment and a bleed is required on them, but not with an adjustable pole model. Indoor pull up banner stands all come with a carrying case that allows them to be carried around easily, especially since they are lightweight. These indoor pull up banner stands come with a full color print that allows for pictures and logos to be placed on the banner graphic as well. Indoor pull up banner stands are just part of a package for vendor booths at trade shows or conventions. if you ad in a table with a table cover and a backdrop banner ( for the back wall of the booth) you pretty much have all the graphics needed for your booth, except for your literature. Indoor pull up banner stands can be found at sign stores that cater to the trade show and convention industry and are generally located near the convention venues. December 18, 2018 Robert W.
Vegas cheapest real estate signs can lead you to quality, inexpensive real estate for sale signs, real estate for lease signs and open house signs for your listings. After all, why spend a fortunate for a real estate signs when you do not have to. With the cost of lead generation going up, dues going up and other costs going up, why pay more for your real estate signs when you do not have to ? Vegas cheapest real estate signs are just that, inexpensive. Whether you are ordering for sale signs, open house signs or foe lease signs. Also, size does not matter. Your signs can be made in the traditional 18″ x 24″ size or custom made the 24″ x 24″ or the increasingly popular 24″ x 30″ size. In addition, for commercial properties and vacant land, we can make your real estate signs in the 4ft x 4ft or 4ft by 8ft sizes as well. Traditionally, the 18″ x 24″ real estate signs are made with .040 aluminum and the larger real estate sings ( 4ft x 4ft or 4ft x 8ft) are made with aluminum epanel or MDO wood. The common 18″ x 24″ real estate signs sell for around $30 each on aluminum and the larger commercial signs sell for around $99 for a 4ft x 4ft and $175 for a 4ft x 8ft on aluminum and slightly higher for the heavier MDO wood sign. 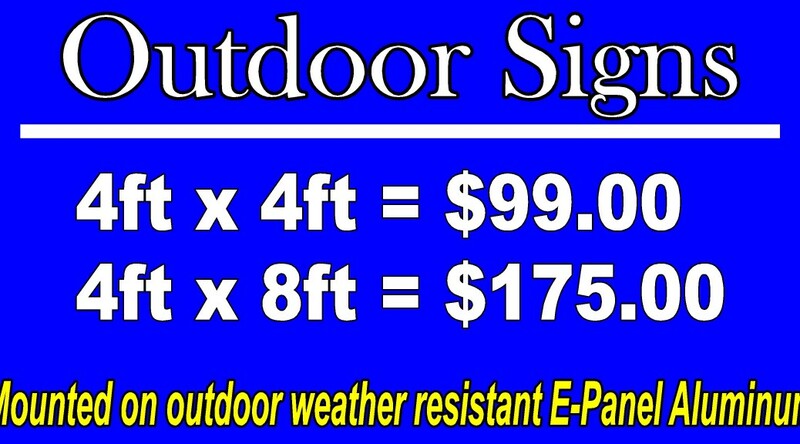 Also increasing in popularity is the 18 x 24 coroplast real estate sign. 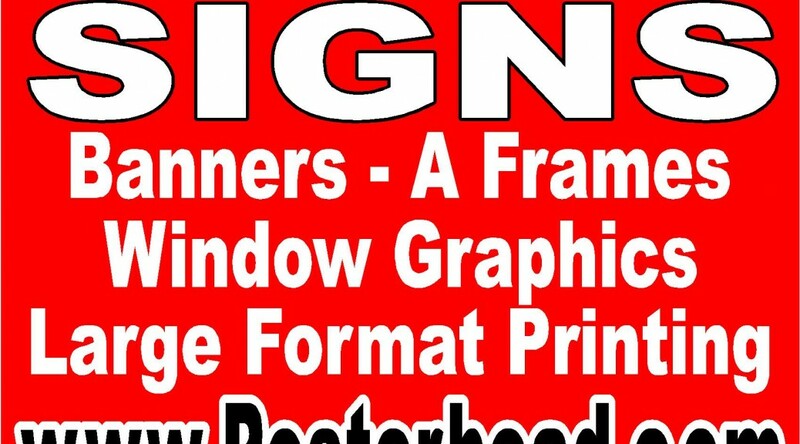 These sign are printed on a 4mm coroplast plastic sign and used for a short term listing of 3 months or so and then simply thrown away at the end of the listing. Many realtors will use these signs when they want to place specific text or descriptions of the property that are only pertinent to that listing. This way they do not have to invest in a more expensive aluminum sign. December 17, 2018 Robert W.
Vegas cheapest commercial real estate signs are used by real estate professionals in Las Vegas to display that a property is for sale or lease. Why pay a lot of money for a large wood real estate sign that will be taken down and thrown away after the sale of a property ? After all, most realtors will customize a real estate for sale or for lease sign to a specific property that is worth thousands of dollars in commission if sold or lease. Vegas cheapest commercial real estate signs are made with MDO wood or aluminum. The design is printed on a vinyl material with eco solvent ink ( special ink that is designed to last in both indoor and outdoor applications ) and then laminated for protection against the weather elements and then applied to wood or aluminum. The inks are long lasting and are environmentally friendly resulting in a long lasting print. 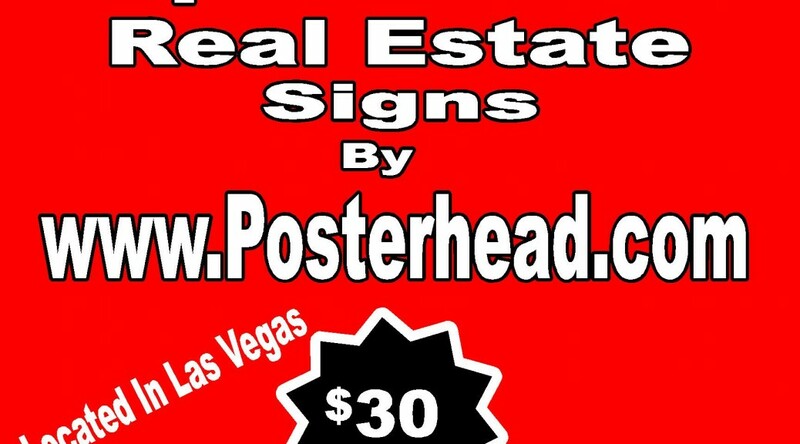 Vegas cheapest commercial real estate signs can be designed and printed at local sign stores in the Las Vegas valley.